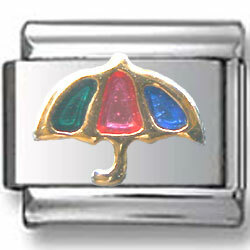 This is one more Big Umbrella Italian Charm to make your bracelet more cute and pretty. Beautiful umbrella is painted in green, red and blue enamel and edged with gold trim. Shiny and quality stainless steel link is wonderful base for this marvelous charm.